Ready to liven up your grilling routine? 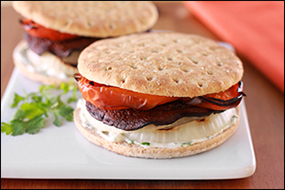 Whether you're a seasoned BBQer or a total newbie, these guilt-free recipes will make your day! No Grill? No Problem... Cook these recipes in batches on a grill pan, and adjust cook times as needed. If the pan doesn't have a lid, just loosely cover it with a skillet lid! In a small bowl, mix vinaigrette with chipotle hot sauce. Transfer to a large sealable plastic bag. Add mushroom caps, seal bag, and gently work the vinaigrette mixture into the mushrooms through the bag. Lay flat in the fridge to marinate for 1 hour. Bring a grill sprayed with nonstick spray to medium heat. Lay marinated mushroom caps, bell pepper quarters, and onion slices on the grill. Discard excess marinade. Cook for 6 minutes with the grill cover down. Flip veggies. With the grill cover down, grill until fully cooked and blackened, about 6 more minutes. In a small bowl, stir cilantro into mayo. Spread mixture onto the bottom halves of the buns. Top each bun bottom with an onion slice, a mushroom cap, and a pepper quarter. Add the bun tops, and serve 'em up! In a wide bowl, combine all ingredients except shrimp and pineapple. Mix until uniform. Add shrimp, and stir to coat. Cover and refrigerate to marinate for 1 hour. Meanwhile, if using wooden skewers, soak in water for 30 minutes to prevent burning. Alternately thread shrimp and pineapple onto four skewers. Discard excess marinade. Bring a grill sprayed with nonstick spray to medium-high heat. Grill kebabs for 3 minutes with the grill cover down. Flip kebabs. 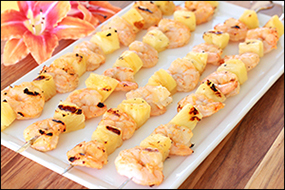 With the grill cover down, grill for 3 minutes, or until shrimp are cooked through and pineapple has lightly browned. There's YUM for everyone here! Click "Send to a Friend" to pass around these recipes.